You guys will know by now that I love my nail vinyl's. 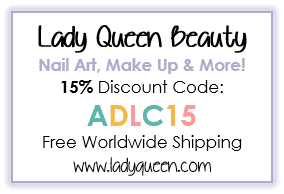 They make for a quick and easy manicure in minutes, with no fuss or stress. 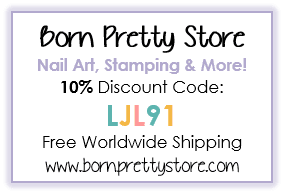 I have some vinyl's & stickers from the store Whats Up Nails to share with you today. 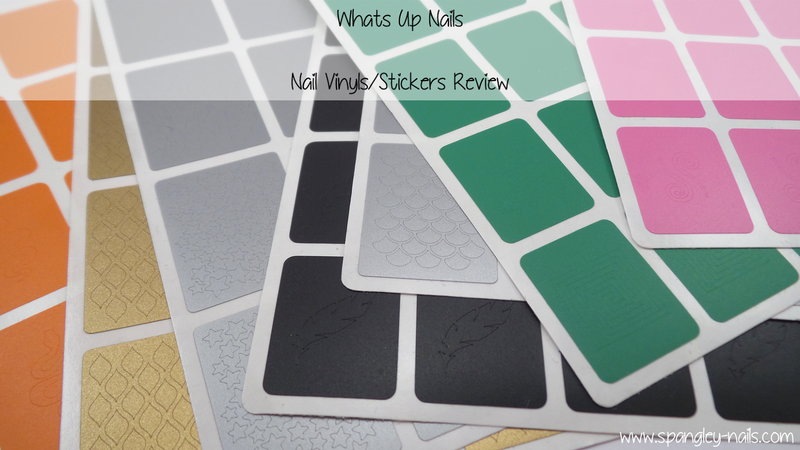 Whats Up Nails is an online store selling everything from Nail Polish, Nail tools, Charms and Stamping Supplies, and is run by Lena from Nails By Freckles. 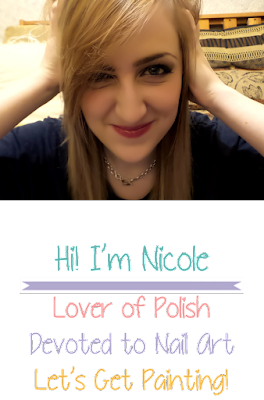 As you know, I usually prepare around 4 manicures for these reviews, but I got a bit carried away and made 5 haha! This is their Stars Stickers & Stencils. 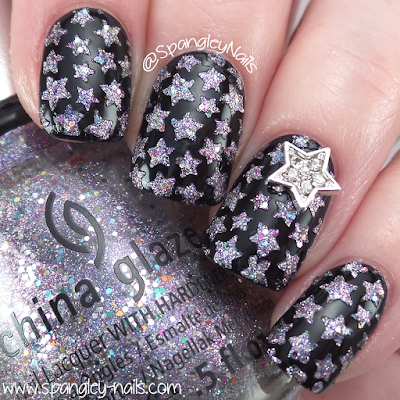 I had been dying to use this vinyl with my new China Glaze polish, which I didn't top coat over and I love that the texture adds dimension to the stars. I've had that little Snake Charm for what seems like forever now, so when I got the Fishnet Stencils, I thought they looked like snake skin, so I had to pair them with my little snake guy for a manicure. 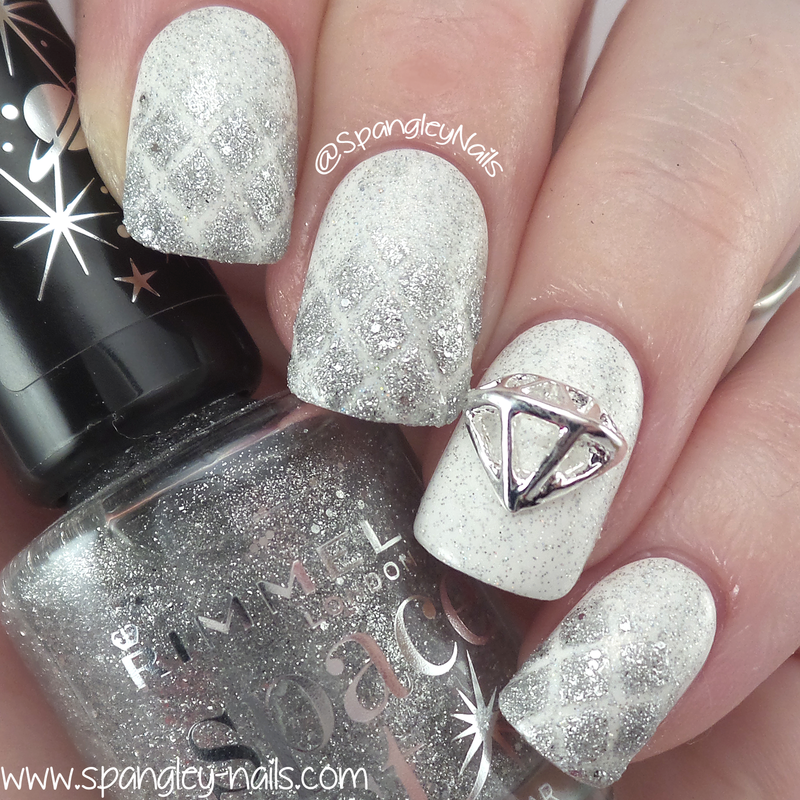 This manicure features the Diamond Pattern Stencils. Again, with the Rimmel Space Dust polish being textured, I did an gradient effect towards the end of the nail for more dimension. Scale (Mermaid) Stencils oh, how I love you! More textured polish for a 3D like effect complete with Pearls and Sea Shells. 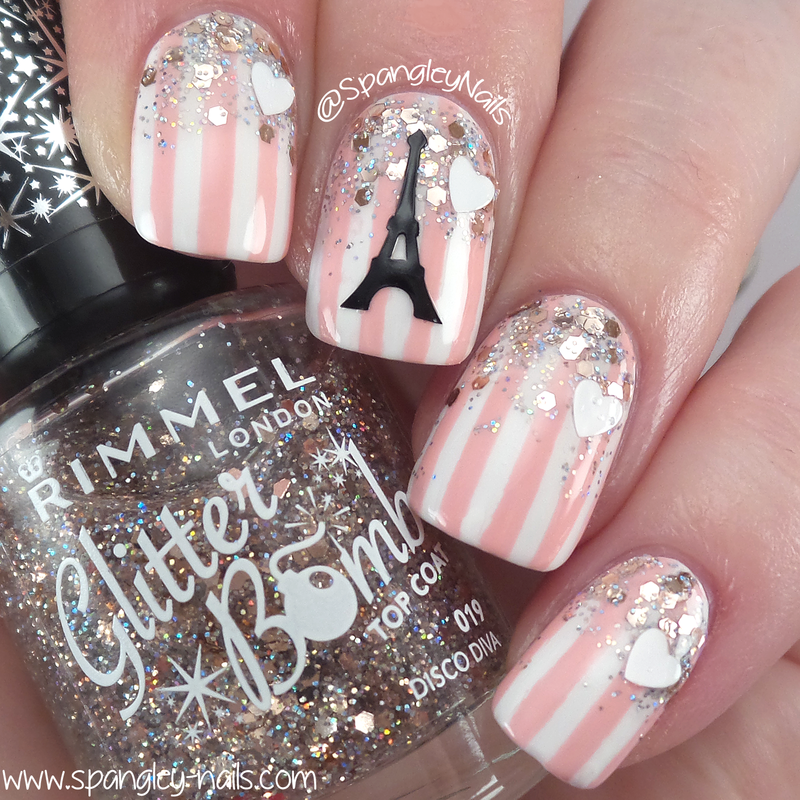 Finally, this manicure features a sticker from the Eiffel Tower Stickers & Stencils Set. Where can I buy these vinyls/stickers? 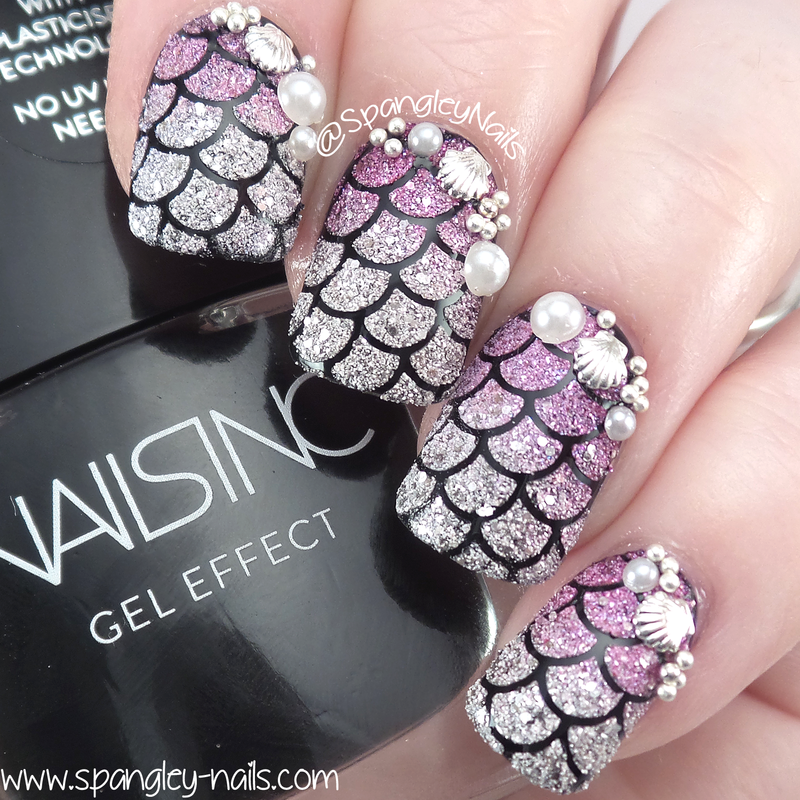 Straight from Whats Up Nails by clicking here. How much does it cost? $3.75 (roughly £2.62) for a medium sheet of 16 stickers or $4.75 (roughly £3.32) for a large sheet of 24 stickers. Any Coupon codes? Yes! 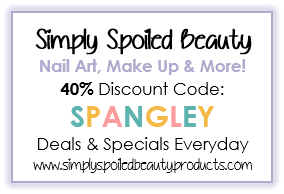 Use code SPANGLEYNAILS10 for 10% off nail vinyls & stickers. How long does it take to arrive? No time at all, mine took around a week! Additional Comments: One thing that sets Whats Up Nail Vinyls apart from the rest is the unique way they cut their vinyls in terms of the sizing. 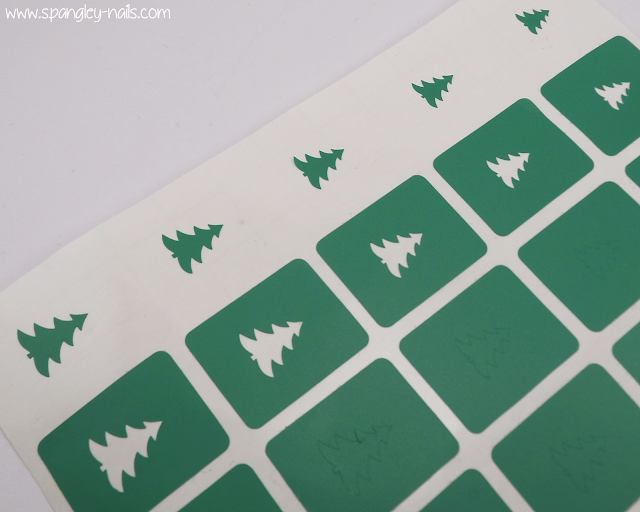 You can see from the picture below of their Christmas Tree Vinyls, that can be used as a sticker or a stencil, that the top tree starts small and the trees get bigger as you go down. 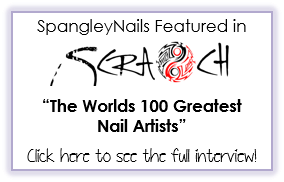 I think this is a great idea and ensures that the vinyls cater for every nail shape and size.